Sotya Flax Oil (fatty acids, omega 3 and 6) 110 pearls. Sotya Flax Oil (fatty acids, omega 3 and 6) 110 pearls. 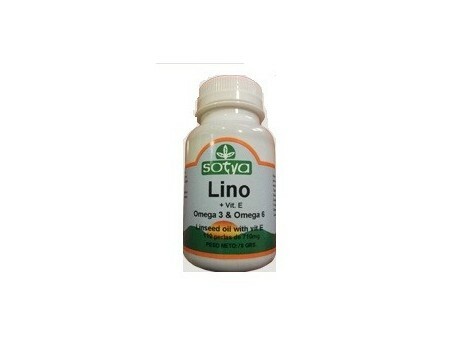 Strong dietary supplement fatty acids, omega 3 and 6. The linseed oil (Flax seed oil) contains essential fatty acids (omega 3 alpha linolenic acid), precursor of EPA and DHA fatty acids and essential for the metabolism of prostaglandins responsible for inflammatory responses, blood pressure , clotting, allergic response, the synthesis of hormones, pre-menstrual symptoms, etc. You could say that is the alternative to fish oil plant (rich in EPA) In addition to its anti-inflammatory action, flax has anti-bacterial and anti-fungal (anti fungal). These properties help to eliminate skin problems like acne. Third, flax oil helps relieve constipation. increasing the frequency of bowel movements. Fourth, lowers bad cholesterol (LDL) and consecunetemente, the risk of cardiovascular disease. Fifth, flax is rich in phytoestrogens (plant compound molecularly similar to estrogen), and this makes the flax a good ally in the Menopause, as a preventative breast cancer and bone loss. Ingredients: 500mg of flax oil first cold pressed, 2.5 mg vitamin E, d-alpha tocopherol acetate, 24% CDR. Nutrition information per 100g: Energy 756kcal, 21g protein, 6g carbohydrates, 72g fat. Directions: Take 3-5 pearls up with the main meals.